Description of "General Insurance Guide"
“General Insurance Guide” is a comprehensive and updated reference book on General Insurance and General Insurance Sector.Synopsis of latest, important and landmark judgements (total 89 judgements) related to non-life insurance claims delivered by Supreme Court of India & National Consumer Disputes Redressal Commission have been incorporated in the book for ready reference. 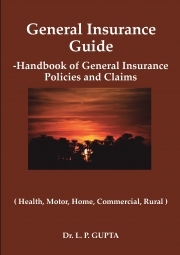 Book explains theoretical & practical aspects of general insurance policies and claims. Book has been written in easy to understand language for the use of common public. Chapters of book include: Basics of Insurance,, Health Insurance, Motor Insurance, Personal Line Insurance, Commercial Insurance, Rural Insurance, Insurance Intermediaries, Insurance Claim Procedures and Requirements, Consumer Grievance Redressal Mechanism, Insurance Law and IRDA Regulations, Court Judgements related to Insurance Claims. It would be found very useful as a Handy- guide for Insurance Consumers, Insurance Consultants, Insurance Employees, Insurance Brokers, Insurance Surveyors, TPAs, Insurance Lawyers, Healthcare providers, Students of Insurance and all stakeholders of general insurance sector. Dr. L. P. GUPTA is a Fellow (General branch) of Insurance Institute of India Mumbai & holder of B.V.Sc. & A.H. degree from JNKVV Jabalpur M.P. India (1971) & retired as Deputy Manager from United India Insurance Company Ltd. (A public sector general insurance company) in 2004 after 24 years of service. Afterwards, he also served as Faculty Member (Insurance) teaching students of MBA at ICFAI National College, Bhopal & Pune for more than two years. His articles on Insurance have been published in newspaper (Central Chronicle, Bhopal), Insurance Chronicle Magazine published by ICFAI Hyderabad. He has published four books on insurance. Reviews of "General Insurance Guide"